With three players each, Borussia Mönchengladbach and RB Leipzig dominate the Team of the Week for Matchday 7. But who else joins Thorgan Hazard, Yussuf Poulsen and friends? That Saturday’s Nordderby between Hamburg and Werder Bremen ended goalless owed much to an inspired display from visiting goalkeeper Jiri Pavlenka. A clean sheet and a hugely impressive seven saves earned him – and you, if you picked him – a handsome points return this week, and a place in the Team of the Week for the second matchday running! Jiri Pavlenka kept his second successive clean sheet in the 0-0 Nordderby draw with Hamburg. A typically combative performance, capped with a goal in Sunday’s 3-2 win over Hoffenheim, ensured Freiburg’s Pascal Stenzel scored highly on Matchday 7, and he’d have scored even higher but for a yellow card. Matthias Ginter’s first goal for Gladbach earned him six points in the win against Hannover, but he also won six duels and had a shot on goal. The versatile Germany international is a handy option indeed. Hummel's header against Hertha was his first goal for Bayern since November 2016. Bayern may have given up two-goal leads to draw for the first time in their history in the 2-2 at Hertha Berlin, but Mats Hummels was a lone bright light, heading home the opener at the Olympic Stadium in the capital. Aside from scoring a goal, going close to a second and generally being everywhere for Leipzig at Cologne on Sunday, Lukas Klostermann can delight not only in bringing you some Fantasy points but also his continued fitness, after he missed almost the entirety of last season with injury. Eighteen-year-old French midfielder Mickael Cuisance, who won three six duels and provided an assist against Hannover, is quite the prospect. Expect to see a lot more of him in the coming weeks and months. Marcel Sabitzer finished the game with two assists in Leipzig’s win at Cologne – both of which were sublimely executed – but such was his part in their dominance that the Austrian can feel aggrieved not to have scored more points. In any case, he deserves credit for a performance combining industry with quality. He said he’d belt the free-kick in against Leverkusen, and he did just that. Leon Goretzka is bang in form for Schalke and had scored against Leverkusen in the past. Watch: Goretzka recalls his stunning goal against Leverkusen. Andriy Yarmolenko doesn’t do ordinary goals. He opened his BVB account with a stunner against Tottenham Hotspur in the UEFA Champions League, and his first Bundesliga goal – at Augsburg on Saturday – was a cheeky backheel through a crowd of players. He also assisted Shinji Kagawa to score a beautiful chip, which turned out to be the winner. He only scored one goal but Yussuf Poulsen scored the most points this week, and that’s because nobody worked harder. He had three attempts on goal aside from the header that won the game, and won an incredible eight duels. 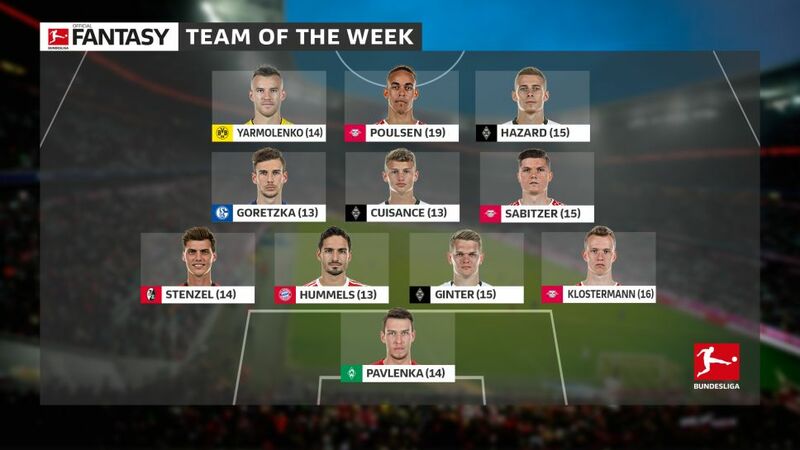 He was named in the Belgium squad this week and Thorgan Hazard looked like he wanted to prove a point against Hannover. He set up three shots on goal, won four challenges and scored the winner from the penalty spot.